This is truly a beautiful hack! From Hack-a-day. The Mandelbrot set – the fractal ‘snowman turned on its side’ seen above – has graced the covers of magazines, journals, and has even been exhibited in art galleries. An impressive feat for what is nothing more than a mathematical function, and has become something of an obsession for [Chiaki Nakajima]. Even on modern computers, generating an image of a portion of the Mandelbrot set takes a good bit of time. When [Chiaki] discovered this fractal in the mid-1980s, the computers of the day took hours to generate a single, low-resolution image. Real-time zooming and scrolling was impossible but [Chiaki] made the best of what he had on hand and built Pyxis, a Mandelbrot set generator made entirely out of TTL logic chips (Google Translate here). The original Pyxis connected to a desktop computer via a breakout box. while a special program toggled the bits and registers inside the Pyxis to generate pictures of the Mandelbrot set a thousand times faster than the CPUs of the day could muster. Time marches on, and the original logic chip Pyxis is can be easily surpassed by even the slowest netbooks. There is, however, another way to build a hardware Mandelbrot set generator: FPGAs. A few years ago, [Chiaki] began work on the Pyxis2010 (translation), an FPGA-based Mandelbrot set generator able to dynamically zoom and pan around the world’s most popular fractal. 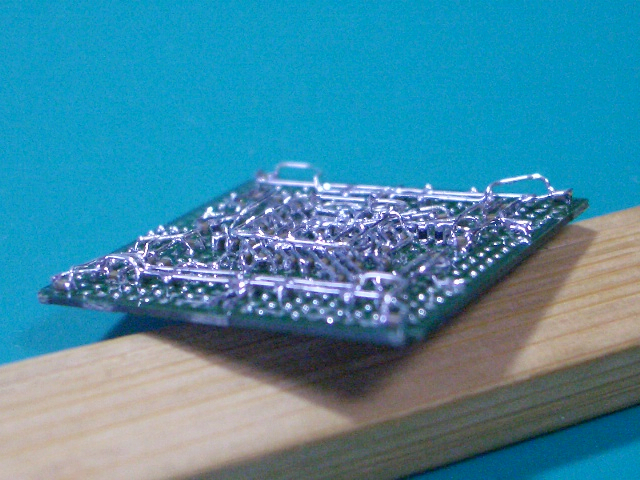 Built around an Altera Cyclone III FPGA he picked up from Digikey for $600 (no, not a dev board, just a bare chip), [Chiaki] began deadbugging his circuit directly onto the pins of the hugely expensive FPGA. A man with a steady hand and no fear if there ever was one. Instead of connecting his Mandelbrot generator to a computer and using it as a co-processor, [Chiaki] decided he wanted something more portable. He found an old Sony PSP, removed the LCD screen, and integrated it into his circuit. After a careful bit of dremeling and fabrication, [Chiaki] had a hand-held Mandelbrot generator that is able to display images of the world’s most famous fractal faster than any desktop computer. It goes without saying this build is incredible. The technical skill to build an insanely fast Mandelbrot generator on an FPGA is astonishing, but basing it off a logic-chip based build reaches into the realm of godliness. You can check out a video of this amazing build after the break. Props to [Ian Finder] for sending this one in.